Forgiven Alcohol Metabolizer, distributed by RH Laboratories, has announced that they will be sponsoring a North American hip hop tour headlined by the Australian trio Bliss N Eso and Vegas-based Big B. The tour kicks off March 17th at SXSW in Austin, Texas and continues on to over a dozen other cities in the western U.S. and Canada. We’re thrilled to be supporting Big B and Bliss N Eso... These guys are incredibly talented and we know the future holds great things for them. Forgiven Alcohol Metabolizer, distributed by RH Laboratories, has announced plans to sponsor a North American hip-hop tour co-headlined by Australia’s biggest hip-hop group, Bliss N Eso, and Vegas heavyweight Big B.
Bliss N Eso, which is comprised of MCs Bliss and Eso alongside DJ Izm, are a multi-platinum Australian hip-hop group who are generally regarded as having one of the most electrifying live shows in the Southern Hemisphere. Their latest album, Running on Air, debuted at #1 on the ARIA Album Chart, they have also won an ARIA Award for Best Urban Album and they regularly headline Australia’s biggest music festivals – not bad for a country where rock music still reigns supreme. American artist Big B has been an underground figurehead since he first debuted on the scene in 2004. He has become known for his raw and honest style, some likening him to a modern day Johnny Cash, where he blends his own elements, namely hip-hop, alternative rock, country and even a little laid-back reggae vibe. After meeting in the States years ago, the two acts have formed a strong bond which came to a head with Big B supporting the trio on their record-breaking 2011 Australian tour, which saw them perform to over 65,000 fans across the country – the largest ever for a local hip-hop act. The 2012 tour kicks off with a performance at SXSW March 17th, and continues on to shows in Scottsdale, Los Angeles, Vancouver, Salt Lake City, Denver, Las Vegas, and many other cities throughout the western United States and Canada. Chas Aday and TJ Lavin formed Forgiven Bottling Group in 2009. 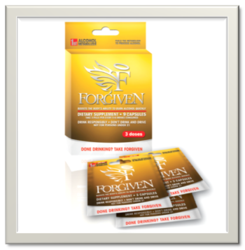 Their product, Forgiven, is the first and only product on the market that has been shown to increase the rate at which the body processes alcohol. In the initial clinical trial, the average increase in metabolic rate was over 500 percent. The product’s proprietary blend of all-natural ingredients includes organic acids, amino acids, vitamins, and herbs that increase the body’s metabolic rate while restoring the necessary amounts of essential vitamins and nutrients. RH Laboratories manufactures RockHard Weekend, an all-natural male sexual performance enhancer as well as Pandora, an all-natural sexual enhancer for women. RH Laboratories is constantly using innovative techniques to promote their products not only as supplements but also as a lifestyle. In addition to the products RH Labs manufactures, they are the exclusive distributor of Forgiven, the world’s first alcohol metabolizer.